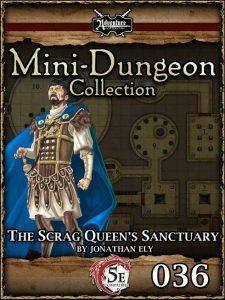 Jonathan Ely’s venture to the “scrag”…äh, pardon, “dragon” queen’s sanctuary is a fun, inexpensive sidetrek that sports atmosphere, a challenging boss and thematically fitting obstacles. The original mainly excelled via the virtue of the unique boss and, alas, this fascination is somewhat lost in the 5E-version – why not use cool lair tricks here? How to rate this, then? Well…I do think that this conversion loses the unique boss of the original, which is a bit of a bummer. What remains is a nice, module, sure, but also one that could have gone one step further. Solid work, 4 stars.